An updated twist on a classic design, the Bradbury Chesterfield Modern Chair is as good as it is eye-catching. Its sturdy design and high-performance upholstery will hold up to your busy family. The fabric is great and looks much better than it appears in the pictures. High-density foam with reversible cover creates extra durability. It is soft, seating is deep, and the chair itself is very comfortable and well crafted. The hand-carved solid wood legs with espresso finish can be attached in minutes so that is quick and easy, no directions needed although they are supplied in the zippered pocket under the chair with the feet. The feet have small plastic additions on the bottom which helped it move very easily and without scratching to get into position on a wood laminate floor. Well constructed with solid pine wood, this Chesterfield modern chair from Stone & Beam is perfectly balanced between firmness and softness and honestly, it’s just a great one. 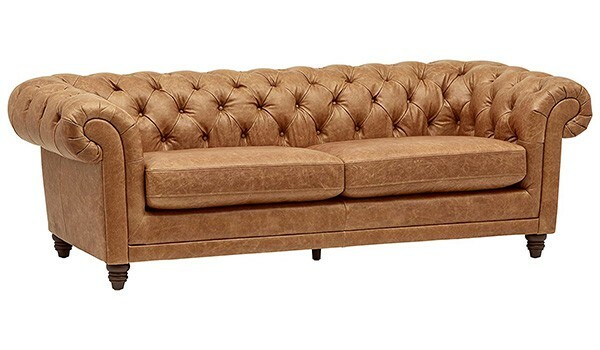 You can match this with a Bradbury Modern Chesterfield Sofa – can’t say enough good things about this Chesterfield sofa and the delivery service. This is the real deal – what you see is exactly what you get. No disappointments after it arrived!